‘Brutal’ rally in dollar-priced crude hammers governments, strains consumers from U.K. to Brazil. For Americans, rising oil prices are threatening $3-a-gallon gasoline and pushing up prices for plane tickets. In many other parts of the world, today’s crude rally is more painful—sparking protests, gas lines and emergency subsidies to quell unrest. That is because many consumers outside the U.S. face a double whammy when—like now—the dollar gets stronger at the same time that oil prices rise. While petroleum is produced all over the globe, when it is sold to refiners and other buyers it is almost always priced in dollars. After Brazil’s military brought an end to a crippling strike by truck drivers over high fuel prices, Mr. Guardia called the oil rally “brutal” for his country. Brazil is among the handful of oil-dependent countries in Latin America and Southeast Asia that have turned to costly fuel subsidies. Across swaths of Africa, higher fuel costs and weakening local currencies have hit prices for food and electronics. Fast-rising crude, on its own, has been pressuring global growth for months. Swiss bank UBS figures that today’s international crude price, around $75 a barrel, would boost global inflation by more than half a percentage point, compared with the $50 barrels the world enjoyed as recently as last year. Brent crude, the international benchmark, has eased off a recent 3½-year high of around $80, on expectations that the Organization of the Petroleum Exporting Countries will boost output when it meets this week. Before that retreat, oil was up more than 20% this year. There are global winners, along with losers. The U.S., squeezed over the decades in past oil rallies, is looking pretty comfortable this time. In recent years, America has boosted production significantly, making it much less dependent on imports. Fuel prices can be particularly painful for specific swaths of any economy. This month, Chinese truckers refused to move goods and blocked roads in a handful of cities, protesting higher fuel costs. Exacerbating the pain in many countries is a strengthening dollar. The WSJ Dollar Index, a measure of the dollar compared with a basket of 16 major currencies, has strengthened 6% since February. In Europe, dollar strength against the euro has helped make crude today about 30% more expensive than when oil was at a low in February. For European consumers, gasoline-price shocks are often dampened by the continent’s generally steep taxes on the fuel. That makes the cost of oil a smaller percentage of the overall price of a liter of gas. This year’s price increase, though, has been so steep that many drivers are feeling the squeeze. Gasoline prices in Britain rose faster in May than in any month on record, according to RAC, a drivers’ lobby group, which called it a “hellish month.” A lower pound against the dollar and higher oil prices were a “toxic combination,” an RAC spokesman said. 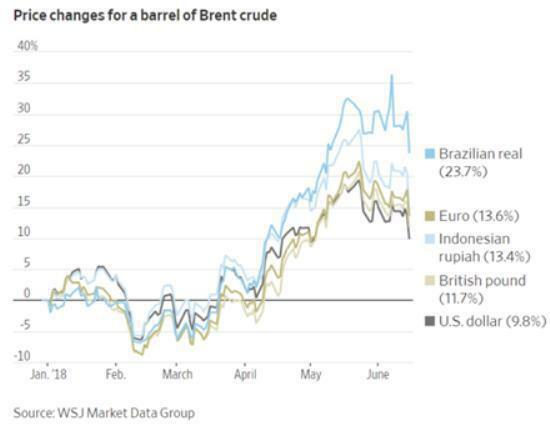 Brent crude is still well below the $100-plus a barrel it fetched from 2011 through 2014, and prices probably aren’t high enough to knock the European economy from its recent upward trajectory. Still, the oil and dollar rally act like a tax, limiting consumers’ discretionary spending. That threatens a pullback in consumption that can eventually hit growth. It can also feed into inflation and pressure central banks to boost borrowing rates. Inflation in Spain jumped to an annualized 2.2% last year from minus 0.2% in 2016, largely due to higher energy prices. The pain has been greatest in economies where dollar strength has been even more pronounced. In Brazil, gasoline is up 28% and diesel fuel for trucks more than 27% over the past year. The Brazilian real has fallen 11% this year against the dollar. The two-week strike by Brazilian truckers stranded goods across the country, triggering warnings about possible shortages from grocery stores, hospitals and McDonald’s outlets. To end the walkout, President Michel Temer rolled out the military and promised truckers $3 billion in diesel-fuel subsides and tax cuts. Brazil’s government has restricted how often fuel suppliers can raise prices, at once a month. As energy prices rose, economists polled by the central bank slashed a full percentage point of growth off Brazil’s forecast output this year, to 2%. In Indonesia, where the rupiah has fallen to its weakest level against the dollar in more than two years, fuel prices are an election issue. President Joko Widodo has promised not to raise prices of subsidized fuels and electricity through 2019, when he is expected to run for a second term. In April, he required fuel retailers, including foreign firms Royal Dutch Shell PLC and Total SA, to seek government approval before raising prices they charge at the pump. Jakarta also said it would dramatically increase diesel subsidies. Thailand and Malaysia—where newly elected Prime Minister Mahathir Mohamed made it a campaign pledge—have both ramped up spending to stabilize pump prices. To sum up the dynamic: Rising oil prices lead to disruptions which force the local government to increase fuel subsidies, which weakens the local currency versus the dollar, which raises oil prices further, which causes disruptions, and so on, until the country turns into Argentina. So if you’re tracking the “crises move from the periphery to the core” thesis, one good guide is the flow of oil. If a country is a big net importer of oil and both the price of oil and the petrodollar exchange rate are rising, it might be the next domino to fall.